President Bush re-nominated all of his unconfirmed judicial nominees last week, including federal district judge Charles Pickering, nominated to the federal court of appeals that covers Mississippi, Texas, and Louisiana. Judge Pickering was targeted by liberal interest groups early last year, subjected to an intense campaign of character assassination, and narrowly defeated in a Senate Judiciary Committee vote that ran along party lines. Those left-wing groups clearly don't want him confirmed, but they appear to relish the idea of another chance to play the race card against Republicans. Pickering's re-nomination had hardly been announced before they and their Senate allies began sputtering in outrage. How could Bush do this, they demanded. After Trent Lott, hadn't Republicans learned their lesson? See, Republicans are out to trample on civil rights! And so on. 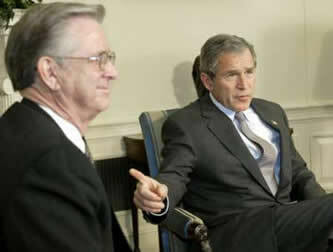 From the moment Judiciary Committee Democrats refused to report Pickering's nomination to the full Senate, President Bush made his feelings plain. He believed that the judge wasn't treated fairly by the committee and that he deserved an up-or-down vote before all 100 Senators. It was a sentiment he repeated numerous times over the course of the year, and that's clearly why he decided to send up this nomination. And Pickering has nothing in common with Trent Lott's infamous remarks. Attempts to link the two are nothing more than race-baiting, a favorite tactic of the Left these days. The real story is that for more than fifty years, Judge Pickering has compiled an impressive record on race-relations. During the 1960s, he worked with the FBI to prosecute violence against blacks, publicly condemning racially motivated violence. In 1967, he testified against the Imperial Wizard of the KKK in Mississippi -- charged with the fire bombing murder of a civil rights activist -- putting himself and his family at risk. In the 1970s, he hired the Mississippi Republican Party's first black political worker. He has served on the board of the University of Mississippi's Institute for Racial Reconciliation. He helped create a program for at-risk black youths in Laurel, Mississippi. He has the strong support of many of his fellow Mississippians, black and white, from both sides of the aisle. In fact, many in the black community who have known him and worked with him wanted to see him confirmed last year -- judges, attorneys, government officials, clergymen, civil rights workers, and others. But Judge Pickering's opponents would rather pretend that this is all irrelevant. They point instead to various incidents or decisions, twist some facts and ignore others, and claim this makes their case. They complain about incidental contacts almost 30 years ago (while he was a state senator) with the Mississippi Sovereignty Commission, a group Pickering voted to shut down. What they don't mention is that he had requested information about a union infiltrated by Ku Klux Klan members, one of whom had been charged with murder -- with Pickering's signature on the affidavit supporting the indictment. Information about the contact is available thanks to Pickering, who voted to preserve the commission's records instead of burning them. Liberals point to an academic article Pickering wrote while a law student in 1959, analyzing -- after a relevant court decision -- how Mississippi's interracial marriage statute differed from those of other states. They ignore the fact that he didn't advocate or support the statute, just as they ignore his statement during his 1990 hearing -- repeated in his 2001 hearing -- that "marriage between people of different races is a matter of personal choice," and that those statutes are unconstitutional. They also ignore his rulings that follow Supreme Court precedent and put those words into practice. Their favorite attack, though, is to insinuate that Judge Pickering is soft on cross burning. In a 1994 case, Pickering expressed concern about the sentence federal prosecutors wanted for a man involved in burning a cross at an interracial couple's home. But there's more to the story than that. With the case before his court, Pickering realized that the ringleader of the three people involved -- who had previously shot at the couple's house -- cut a deal with prosecutors and got off without any jail time, while the prosecutors demanded seven and a half years in prison for another defendant. Pickering thought the proposed sentence was disproportionate and asked the government lawyers how the two sentencing statutes they cited had been used in other federal courts. He asked at least three times without getting an answer, until they finally dropped their sentencing request down to two and a half years. Judge Pickering sentenced the man to 27 months, chewed him out from the bench about his "despicable act" that "cannot and will not be tolerated" and advised him to spend his prison time doing something useful like reading up on how to maintain good race relations. That's it. Pickering was concerned about a possible sentence even prosecutors called "draconian," sentenced the criminal to prison, and expressed his outrage at "an area that we've got to stamp out" because "we've got to learn to live, races among each other." But you'll never hear all that listening to John Edwards, Charles Schumer, or People for the American Way. When he was nominated to the U.S. District Court a few years back, the Judiciary Committee reported him out unanimously. Among those who supported him were current committee Democrats Patrick Leahy, Ted Kennedy, Joseph Biden, and Herb Kohl. His nomination went on to the full Senate, where he was then confirmed -- unanimously. Judge Pickering's character hasn't changed since then, and neither has the quality of his record. He has a decade of experience. The people who know him best support him. The American Bar Association examined his qualifications and commitment to equal justice and pronounced him well-qualified. And, like last year, he has the votes on the Senate floor for confirmation. Pickering deserves that vote in the full Senate. Despite threats of a Democrat filibuster, it looks as if he may finally get it.